What you can see here is a typical mid-week meal that me and my husband have on a regular basis. It’s a quick and easy dinner choice. Both healthy and filling. Tonight we had a very typical German dinner. 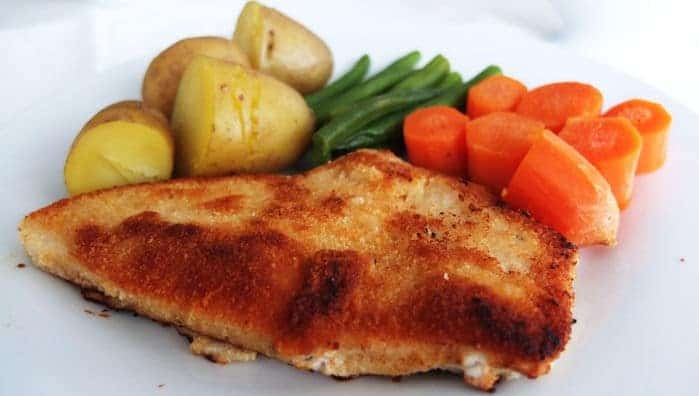 “Putenschnitzel” is a more modern variation of the traditional Schnitzel, as health conscious Germans will substitute the pork for the leaner meat turkey. In English Schnitzel always means meat cuts with breadcrumbs where in German it includes any meat that has been flattend with a steak hammer or meat tenderizer (Fleischklopfer). By tenderizing the meat, it softens the muscle and makes it easier to chew and digest. I often use this Schnitzel recipe to make turkey more interesting for my husband because turkey can get a bit dry and boring if not cooked in the right way. I like adding garlic to my coating to give it the extra umpf but you can leave it out if you prefer. We normally eat it with vegetables and some sauce but I will often put the leftovers on my husband’s sandwiches for work the next day. Schnitzel sandwich is one of his favorites. Whisk the egg and place it in a large plate or deep pasta bowl. Add the garlic, chilli and season with salt and pepper. In a second bowl pour in some breadcrumbs making sure that the mixture covers the surface of the bottom. Heat the oil on a medium heat in a large frying pan. Take a meat hammer, of if you do not have one substitute with a rolling pin and begin tenderizing the meat by either flattening it with the hammer or rolling it with the rolling pin. Now take one schnitzel and and place it into the egg mixture. Turn the schnitzel over to make sure it is coated on both sides. Straight away place it on the other plate with the bread crumbs and make sure the schnitzel is covered on both sides again. Place it into the hot pan and fry on each site for 3 minutes or until the breadcrumbs are browned and the meat cooked. Serve with potatoes and vegetables. They taste amazing cold on a sandwich for the next day. 3 Responses to "German Turkey Schnitzel with Garlic Seasoning"
Lecker. 🙂 Interesting garlic sauce. Beautiful colors of the picture on that white table-cloth. Schnitzel sandwiches are indeed fabulous. Thanks Al! Yes the garlic does give it a little extra taste. Enjoy your weekend.